Just a few hours ago, a visitor from Earth reached the Red Planet and traded her terra-bound orbit for a Mars-centric one. The Mars Atmosphere and Volatile Evolution spacecraft, or MAVEN, has a specific assignment: to characterize the upper atmosphere of our neighboring world and the processes that shape its evolution over time. 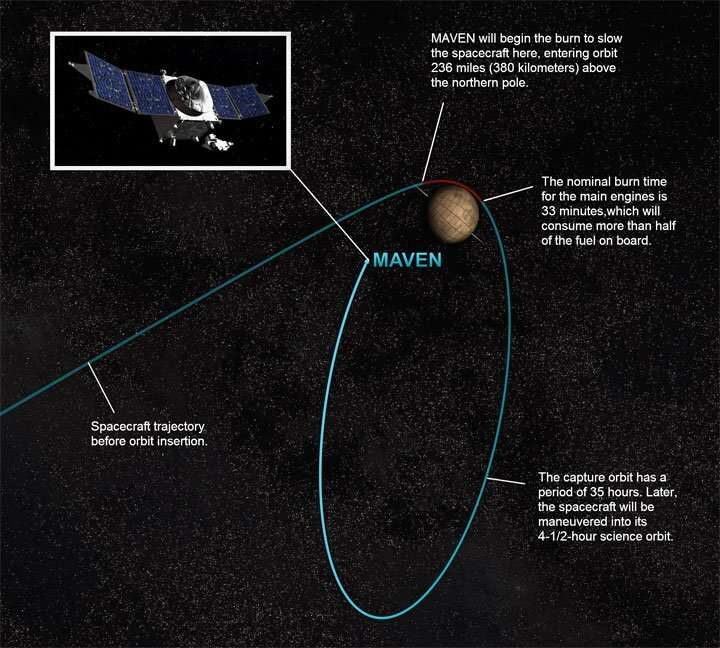 MAVEN is an exciting mission, and it’s taken 10 months and 442 million miles just to get into orbit. It will take another five weeks to circularize that orbit and settle into the primary measurement configuration. That may seem like a long time (to say nothing of the preparations and planning leading up to the launch last November), but MAVEN is part of a much longer tradition that puts our most recent ambassador to Mars in perspective. Mars has long been an object of fascination for astronomers and the public alike, and its mysterious atmosphere has stubbornly remained at the center of speculations as to the planet’s past (and current potential) habitability. The characteristics of the atmosphere – its composition and density – control the possibility for liquid water to exist on the surface. 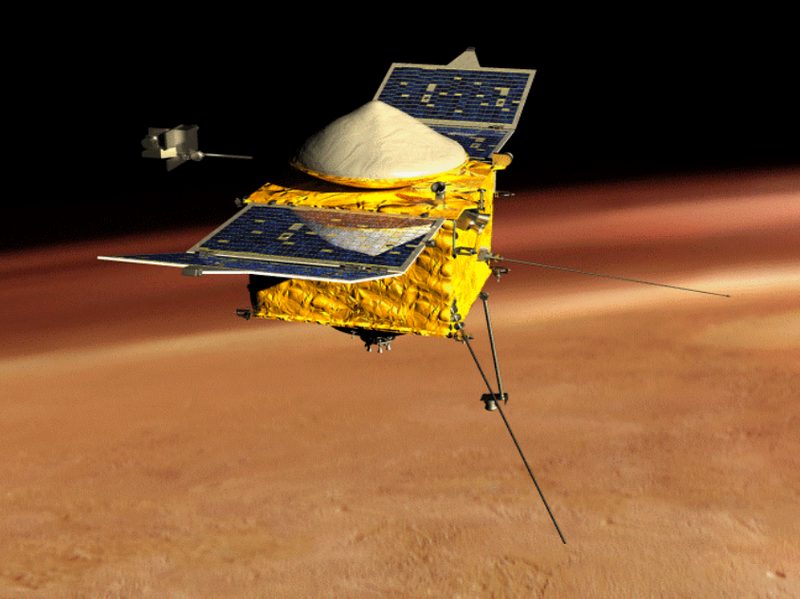 Mars’ atmosphere is more than 100 times thinner than Earth’s, and it’s made up of different molecules. Whereas Earth is shrouded with a thick nitrogen blanket (77% by volume) with ample oxygen thrown in (21%), Mars’ more tenuous atmosphere is 96% carbon dioxide. 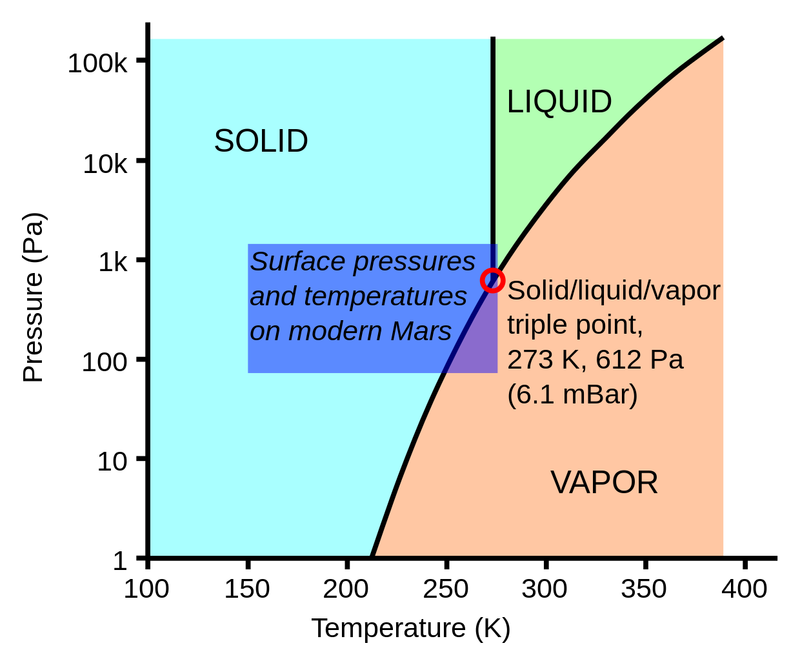 Although the total atmospheric pressure at the surface (~6 millibars) seems to just barely put Mars within reach of the triple point for water (the lowest pressure at which liquid water can exist), it’s the partial pressure of water vapor that needs to be that high, and at 0.03% by volume, there’s just not enough of it there. Whether Herschel’s “clouds and vapours” really existed was a matter of debate for much of the 19th century. Johann Schröter agreed with his mentor, writing that “the same shapes and positions develop and pass away again, as one would expect of the variable atmospheric appearances occurring above a solid surface.” In 1830, the great mapmakers Beer and Mädler denied the existence any atmosphere, having themselves observed no changes that might be attributed to clouds or mists hovering above the surface. Nevertheless, the idea persisted, and with it the assumption that the composition of a Martian atmosphere would match that of Earth’s. Richard Proctor’s 1870 book Other Worlds Than Ours cited early spectrographic observations from a Dr. Huggins in support of an Earth-like atmosphere for Mars. “[W]e know that it is the aqueous vapor in our air which causes the appearance of the lines in question. Hence there must be aqueous vapor in the Martial atmosphere.” The detection of water vapor (or its absence) remained a hot topic throughout the remainder of the 19th century and well into the 20th. In 1909, W. W. Campbell, director of the Lick Observatory, published results showing that the “quantity of water vapor present, if any, must be very slight,” directly contradicting observations by Slipher and Very the year before. In the 1920s and 1930s, Walter S. Adams made several attempts to detect Martian water vapor and oxygen, to no avail. 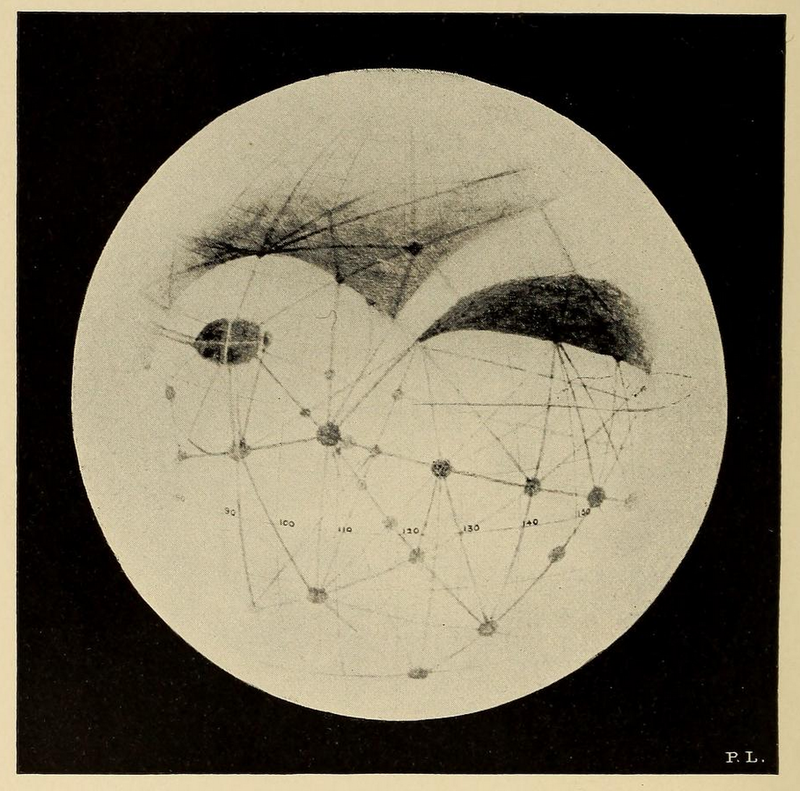 These observations and debates were occurring in the midst of the (in)famous Martian canal controversy, driven in large part by Percival Lowell, who founded an observatory in Flagstaff, Arizona, just in time for the 1894 opposition of Mars. To Lowell, the seasonal polar caps and linear markings he interpreted as artificial constructions suggested a vast network of channels meant to control and conserve surface water on a planet that, due to its smaller size and greater distance from the Sun, was at an advanced stage of planetary evolution relative to Earth. The canals were thus an expression of ecological disaster, a last attempt to manage a dwindling resource, and a dire warning for mankind as to the fate of our home planet. The canal controversy fired the public imagination and Mars became a canvas on which to project our own fears and hopes for the future. Today, we know that the “canals” were not built by intelligent Martians, and we have sent our envoys to orbit the Red Planet and traverse its dry and windswept surface. In 1963, Andouin Dollfus released his observations of a very minute amount of water vapor present in the Martian atmosphere, and a few years later, Mariner 9 returned a close-up look at the surface features so long imagined from Earth. The 1976 Viking landers established the composition of the atmosphere to unprecedented accuracy, and many planetary missions since then have returned a wealth of information about our neighbor’s current and past climates. There is much we still don’t know, however, and by concentrating on the processes of the upper atmosphere, where molecules might escape due to simple thermal velocity or be stripped off by interactions with the solar wind, MAVEN will tell us about the planetary evolution that so captivated Lowell and many others a century ago. It is likely that Mars once had a much thicker atmosphere than it does today, and while there are many theories and models that could explain why it disappeared, we don’t yet know the answer. MAVEN’s seamless arrival at the Red Planet will soon help us fill in some of the gaps in our understanding, extending and upholding a long tradition of inquiry into Mars’ mysterious atmosphere. Image credits: MAVEN spacecraft (image courtesy of NASA); MAVEN’s orbit insertion maneuver (image courtesy of NASA); phase diagram for water (Wikimedia Commons); Martian polar caps, sketches by Herschel (Phil. Trans. R. Soc., vol. 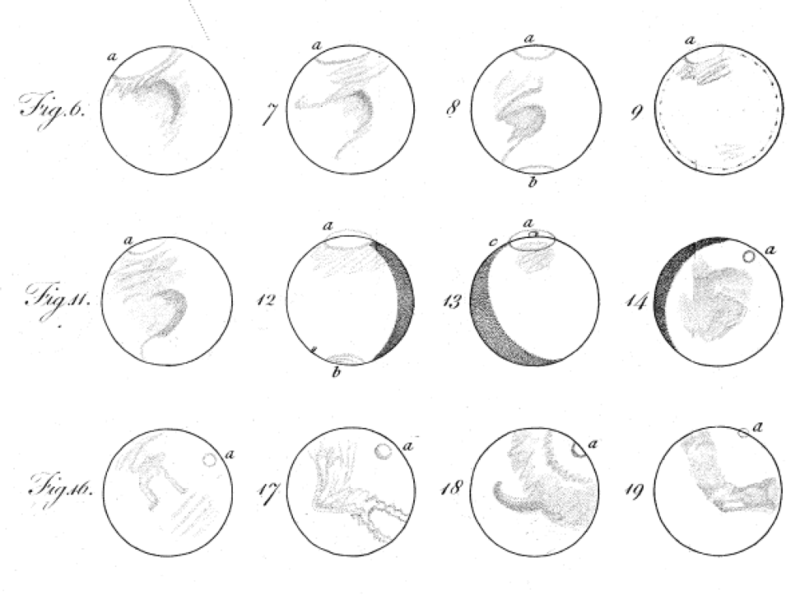 74, 1784); Sketch of Mars, Plate VII, by Lowell (Mars, 1895).